Adrift in a massive wooden vessel upon the watery deluge that has drowned the world and everyone in it, surrounded by thousands of hibernating beasts and one unseen stowaway, the only living human family left alive huddles around a warm brazier. Noah (Russell Crowe), the clan patriarch and driving force of this most vital of nautical ventures, recounts his discouraged loved ones the story of the creation of the world and of life to inhabit it. 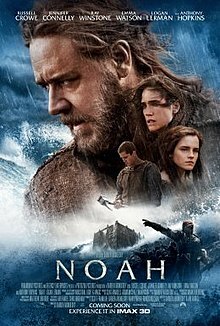 The sequence of Noah’s telling of the events of the Bible’s Genesis 1 constitutes a flashback tangent from the plot of Noah, but director Darren Aronofsky realizes its thematic importance and crafts it into a remarkable audio-visual thesis statement for his tremendously ambitious but not always successfully awesome biblical epic. Narrated by Crowe’s Noah in a sturdily poetic reworking of the familiar words of the King James Version (the cojones of that choice alone! ), it moves from a light in the darkness through cosmic coalescence to planetary constitution, the flowering of plants and spread of animals, and Adam and Eve in Eden along with a slithering snake and a tantalizing fruit beating like a heart. Aronofsky moves through billions of years in enervating time-lapse photography, audaciously embedding a depiction of evolutionary science at the very core of the Genesis tale that predetermines creationism. The sequence concludes with the unforgivable sin of Cain slaying Abel in black silhouette before a vibrant sunrise (or sunset, the more likely given the ideas being expressed), the forms of both men cycling through the weapons and armour of all of the human race’s eras of war as the body of the slain falls. It’s the grandeur of Kubrick mashed together with Aronofsky’s own indie-bred existentialism run through the visual method of Madonna’s “Ray of Light” music video. The Onion‘s A.V. Club named it one of their top film scenes of 2014. I wouldn’t argue. Coming where it does in Noah, the Creation sequence re-entrenches the main point of the larger tale and functions as an attempt by the fanatically devoted ark-builder to re-establish the importance of his mission to his doubting family unit. Mankind is irredeemably wicked, and so they must die en masse, with the sole scant exceptions to this holocaust tasked to sail animal life to safety before expiring themselves. At least this is how Noah interprets the dream visions that he attributes to his Creator, who is otherwise characterized as an impassive, cloudy sky who answers no queries as to his intentions. Perhaps the Creator finds this humourless zealot who purports to act in his name too insufferable to bother replying to, though not to use to achieve larger aims. This is latter-day Russell Crowe, after all, who can no longer lower himself to take on the role of anything less than a prophet or Christ-figure. Noble suffering abounds. His family follows him, but finds it increasingly difficult. His wife Naameh (Jennifer Connelly) and sons Shem (Douglas Booth), Ham (Logan Lerman), and Japhet (Leo McHugh Carroll) are pained that the family line will end with them, what with their lack of female childbearers. Ila (Emma Watson), adopted daughter and lover of Shem, is barren due to a childhood wound and feels guilt at being with Shem and denying him a humanity-saving chance to procreate (recall this relationship dilemma the next time you and your significant other have a tiff over househould chore distribution). And, of course, the rest of the human race is hardly chuffed at being denied a berth on the ark and left to drown. Their representive is Tubal-cain (Ray Winstone), an aggressive warlord who preaches the gospel of muscular self-reliance and promises to fight his way onto the boat if it’s the last thing he does. Noah also includes Anthony Hopkins as Methuselah, an old mystical cave hermit with a powerful craving for berries. We cannot likewise forget the single goofiest element in the film: the Watchers, glowing, lumbering CGI rock giants who help Noah build the ark and defend it from Tubal-cain’s legions. They’re actually fallen angels encased in stone as punishment for their transgressions, and though the Watchers are resolutely non-biblical, they do have some grounding in religious texts of the ancient world (they’re described in the ancient Jewish work the Book of Enoch). Scholarly backing, and a sympathetic vocal performance from Frank Langella as one of the primary giants, lends the Watchers some support, but they are the most left field of elements in a movie that frequently challenges popular assumptions about a well-known myth almost to the point of straining all measure of credulity. The suspension of disbelief ebbs gradually out of Noah and the temptation to scoff the film away creeps in slow, much as it has into this review. It’s worth keeping in mind that the story of Noah’s ark might be the single wackiest thing in the whole of the canonical Bible, which is really saying something when you take the talking snakes and raining amphibians and parted seas and proscriptions on seafood into account, to say nothing of the phantasmagorical, hallucinatory nightmare of Revelations (which even the most grimly dedicated of scriptual literalists must admit is just a tad metaphorical). Noah’s story is already operating on the level of fantasy, Aronofsky supposes, so why not push it as far as it will go? Why not portray magic and miracles alongside the weightiest moral choices ever faced by a mere man? It’s not an invalid approach to the material, and Aronofsky’s vision is often remarkable. But Noah has deeper and more tangled issues than those that can be resolved by an auteur’s visual mastery or a handsome visual effects budget. Noah is invested in a faith-based sense of morality that is overtly unspecific but unquestionably Judeo-Christian in character, contained in a general visual storytelling package that is less secular than outright pagan. It’s too invested in belief to appeal to rationalists and too loose with sacred detail to persuade the faithful. The creation sequence is the film’s genetic code: no matter how striking Noah is as a piece of imaginative blockbuster filmmaking, it wants to have it both ways, be all things to all viewers. Aronofsky doesn’t want to alienate, but that instinct prevents him from transcending.